Happy First Birthday to Nelly Ben Hayoun’s Doppelgängers! On May 8th 2017, Nelly Ben Hayoun launched a new hyperreal experience challenging notions of space and time, but also questioning the politics and economics of performance and public speaking at the digital conference re:publica in Berlin. The experience centred around two doppelgängers performing as Nelly on stage, with the aim of them and Nelly making appearances at multiple places and various locations in years to come. And now, one year later, we’re happy to celebrate the doppelgängers’ first birthday! 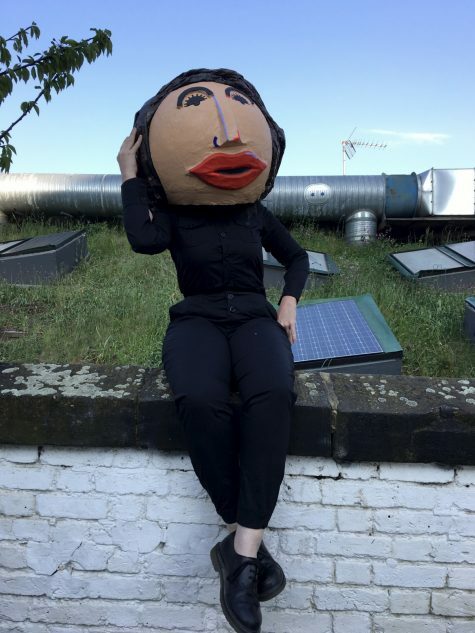 In honour of this we have launched a limited edition Dr Nelly Ben Hayoun mask to wear when you need inspiration, and when you need to dream above and beyond! Stay tuned as we share more of the doppelgängers getting into mischief in the coming weeks! You can check out our Instagram to see what our doppelgängers have been up to so far! And lest we forget our original doppelgängers, here’s a reminder of who they are! Aglaé was born in 1995 in the south of France, moved to Scotland when she was 18 to study Acting and Performance. She’s a trilingual actor, model and videographer. She contributes to NBH studios by working as Nelly Ben Hayoun’s doppelgänger and showing how Acting and Performance can be used in experiences and public speeches to engage with an audience. Her work is inspired by Shakespeare, Harold Pinter, Jean Genet and Edith Piaf. Anaïs was born in 1991 in the south of France, moved to Spain when she was 18 to study history of Art. After graduating, she started studying Fashion Design in 2016. She’s a trilingual fashion designer, painter and photographer. She contributes to NBH studios by working as Nelly Ben Hayoun’s doppelgänger and expressing how performance, fashion, design and science can work together to connect with members of the public. Her work is inspired by PopArt, Leonardo Da Vinci, Charles Baudelaire and Alexander McQueen.